Andy Peaks was in a typically honest mood after AFC Rushden & Diamonds put another point on the board with a 1-1 draw against Leiston. 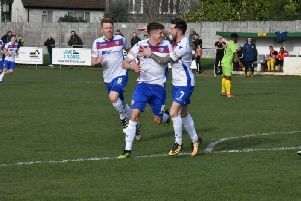 A ‘Pay What You Want’ initiative attracted another 600-plus attendance to Hayden Road and they saw Diamonds take the lead thanks to a first-half header from Jack Ashton. But Leiston hit back after the break thanks to a Matthew Rutterford goal and Diamonds boss Peaks conceded his team were “not good enough to win”. “To be honest, a point was all we were worth,” he said. “We were not good enough to win the game and, in the end, we could have lost. “The fact is that unless we are right on our game and we have eight or nine players right at it, then we will find it hard and this was one of those occasions when we weren’t quite at it. “We weren’t good enough in possession and, having played so well down at Leiston, I think they may have come here with a bit of fear but as the game went on, they grew in belief and we went the other way. The draw has left Diamonds five points adrift of the play-off places ahead of their big clash with third-placed Stratford Town at Hayden Road on Tuesday night. And while Peaks remains happy with the club’s debut season at Step 3, he is keen to ensure it doesn’t just peter out. “I want us to have everything to play for when we go into the last five weeks of the season,” he added. “No matter which way it goes from here, I think we can be happy with what we have done. “But it would be a shame if, having got ourselves into a good position, the season just fizzes out.